Okay, I received the Land's End Aqua Terra Tank yesterday. First, I ordered an 18W, when I probably should have ordered a 16W. I wear in XL 16-18 top in Misses, but was afraid to order the Misses size and have it be too small about my hips. It is available in both misses and plus sizes. First, the bra. I have C/D cups -- this was a full-cut, full all-around, lightly padded shelf bra. Full d's and even dd's would be thrilled! The 3" band of elastic kept the bra in place and it was comfortable on. I could tell that if I had enough to fill it, it would have provided good (not awesome) support. If I adjusted the girls they would stay in place, but eventually would be pointing south -- but I really think it was because the bra was too big for me. I need the 18 misses or 16W. The material was very nice. High quality, very smooth lycra and sewn together so it was "seamless", like good quality bike shorts. Very, very comfortable to wear. The shape is very flattering on... it's not square, nor is it too snug -- it's cut for a curvy figure, so it made my hips happy! For me, I have a lot of lose skin on my stomach area, so anything snug tends to be not-so-flattering (i.e. cottage cheese). This was not snug. The fit was just right, even a little lose through the midriff area... again, I probably needed the smaller size, but I'm just so used to tech apparel not fitting right, that I tend to buy too big! 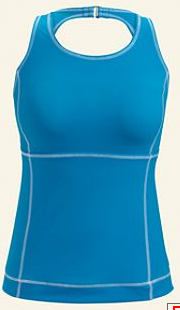 Overall, I think this garment is "Athena-friendly" and great for a tri. If you're a real runner though, be sure to checkout the size charts and make sure you get the right fit for your chest. Oh, and they're on sale right now.